15 year old Mary Finn is mature beyond her years. Her mother died after having her last baby two years ago. She's had to be a mother to her younger siblings while her father works hard to provide for them. Now he's found a new wife and she wants Mary out of the picture. Years later, six year old James must leave the only home he's ever known, his foster parents' the Peeveys. He must return to the Foundling home, the place his birth mother left him as an infant. Missing his family, he uses his charm and his cleverness to make a place for himself in the foundling home. Folly by Marthe Jocelyn is told through four alternating points of view: Mary, Eliza another housemaid in the Neville House, James and Oliver a teacher at the Foundling school. At first, I thought I would be overwhelmed by the number of voices in this fairly short work. However, seeing both Mary and James through another pair of eyes added much to the story. I enjoyed the strong and distinctive voices of the characters. Mary is sympathetic as a friendless girl with no mother to give her advice. It's easy to see how made her folly with Caden Tucker. Eliza is so blinded by jealously she completely misses the truth staring her in the face. Oliver is probably the most enigmatic. But the character I loved the most was James. He's a little fighter. Marthe Jocelyn wrote Folly as an homage to her ancestors. I liked that the most about the book. These events were happening to real people. For a poor young girl with no family or friends, life was terribly hard. It felt authentic. The only problem I had was what happened to Mary in the time between. Jocelyn just kind of skims over that but I would have liked to know how she got to where she was at the end. It's a quick read. I finished it in about a day. It's an enjoyable read for lovers of historical fiction. 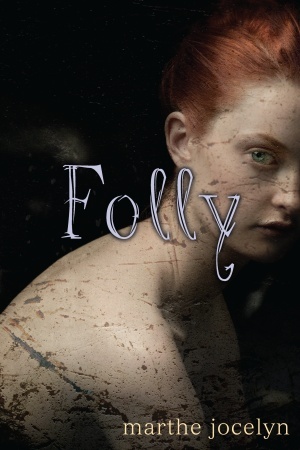 Folly is published by Tundra Books. I won it on Twitter. I am really drawn to the cover, so I'm glad to see you enjoyed the book! Like you, I also would have liked to have seen more of Mary's story in between those years! Like Kathy, I find the cover very compelling. I could use a book like this right now - a quick, fun read. I hadn't herd of this book before now. Thanks for bringing it to my attention with your wonderful review. I added it to my TBR.